I have extensive experience photographing vaporizer pens (aka vape pens or e-cigs). When photographing products like these to help companies sell online, it's important to draw attention to the most critical components. In this case, the liquid is the most important consideration. To make the liquid stand out in this photograph, backlighting was used to make the golden fluid stand out. Side lighting techniques were also used to create dimensionality for the item. Advanced retouching was employed to clean up the reflections and add the drop shadow seen in this image. 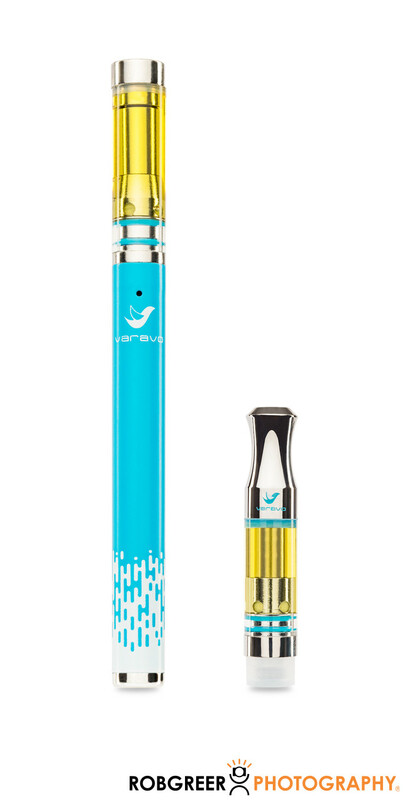 Vape pens are electronic cigarettes used to vaporize liquids for recreational inhalation. Vaporization refers to the transition of a solid or liquid to a gas. For e-cigarettes, vaporization occurs when the liquid content of herbs, marijuana, oil, tobacco, or wax is heated and becomes a mist. That vaporized e-liquid is then inhaled by consumers. These devices are available in all shapes, sizes, and capabilities. Components of vape pens can include the barrel body, the coil, the atomizer tank, and the mouthpiece. The goal for this kind of photography project is to create images that represent this product in an appealing manner. There are several types of extraction chambers available in e-cigarettes including straight bore, venturi, and sequential venturi. Most vape pens are made of metal or glass. These vaping devices are battery powered and are intended to simulate smoking. The e-cigarette was invented by Chinese pharmacist Hon Lik in 2003. Customers use vape pens to save money, reduce health risks, and attempt to quit smoking. Because using these devices is like smoking, legislation often applies to the use and restrictions on smoking may often also apply to e-cigarettes. In 2016, the FDA expanded its power to also include regulatory power of e-cigarettes. These product photography examples are from one of several product photography jobs that I’ve completed for Varavo. This company is best known for producing cannabis infused edibles and vaporizer products. All vaporizer products offered include cannabis oil processed using fresh flowers using CO2 extraction and distillation technology.